At this point I had 10 minutes to be 1 mile upstream to meet wifey.... I did however manage to shoot this swooshy bit of modern architecture before realizing my miscalculation. 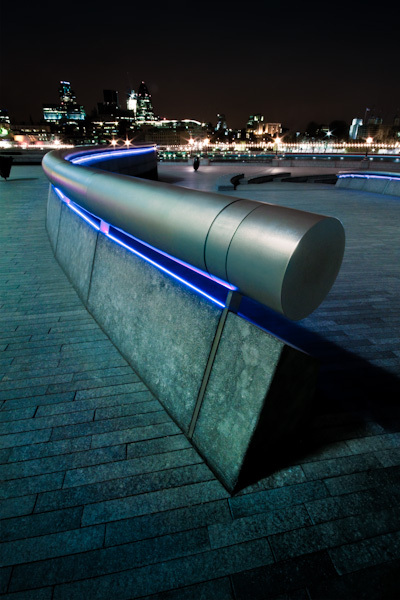 Taken from the edge of the scoop, City Hall, London. To get this as the sun is rising or setting would be a bit better I think. Also like to try again using a graduated ND filter to moderate the horizon a bit more. Ok, so I'm a picky photographer.. lol. I think it's the Thames but it looks serpentine ... Nice! @mramshaw.. You're right with your first guess.. River Thames it is, over near Tower Bridge. The photo has been viewed 2089 times.